Groundwork Cincinnati youth on the Mill Creek Greenway en route to service learning fieldwork site. Twenty years ago, in some inner-city stretches of Mill Creek, the only living things you could find were blood worms, sludge worms, and leeches. In the summertime, fish kills were common. Carp that ventured into the stream from the Ohio River would flop onto the stream banks and die. Many species of aquatic and terrestrial wildlife vanished from the river corridor for over 100 years because their habitat and food sources had been destroyed by intense urbanization. In 1992, the Ohio Department of Health determined that Mill Creek fish were unsafe to eat and the Ohio Environmental Protection Agency recommended no body contact with the water because of high levels of untreated sewage. In 1997, the national group American Rivers designated Mill Creek as the most endangered urban river in North America. Most people felt the Mill Creek was a hopeless cause. Twenty years ago, a small nonprofit, then named Mill Creek Restoration Project and now called Groundwork Cincinnati/Mill Creek, made a commitment against these manifestly long odds to bring Mill Creek back to life. Groundwork Cincinnati is one of the original 10 EPA Urban Waters Fellows, and received technical services from Groundwork USA and River Network as part of the establishment of the Urban Waters Learning Network in 2010. The nonprofit became a Groundwork Trust in 2012. Today, the city’s Mill Creek Greenway Program is the vehicle for implementing a comprehensive Mill Creek Healthy People/Healthy River Strategy that provides multiple public benefits. The premise of the strategy is that all City neighborhoods should be livable and sustainable, and that by definition livable and sustainable neighborhoods have healthy natural resources and healthy people living in them. Working with teachers, Groundwork Cincinnati provides a variety of classroom and fieldwork learning experiences that help empower young people by giving them real challenges and helping them develop skills to meet those challenges. In both the school-based program and in Groundwork’s summer Green Team youth employment program, participating students also learn about potential careers and career pathways. 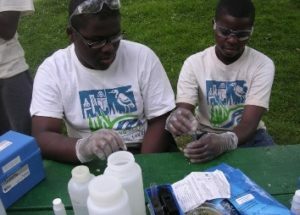 To date, over 39,000 Green Team youth in the Cincinnati Public School (CPS) District and others Districts in the Mill Creek watershed have participated in year-round educational programming, using the Mill Creek as a living laboratory and participating in ecological service learning projects. In CPS schools, about two-thirds of the students are African American and come from economically disadvantaged families. To improve the river’s health, Groundwork, its partners and students, and over 9,000 adult volunteers have completed 33 wetland, stream bank, and wildlife habitat projects. Thousands of trees have been planted, and derelict properties along almost five miles of the river have been transformed into public greenspace, trails, and edible forest gardens. In 2009, Groundwork began work on the city’s Mill Creek Greenway Trail. The hike and bike trail provides opportunities for active transportation and outdoor exercise and recreation for Mill Creek neighborhood residents and visitors. For every dollar the city has invested, in any given year, Groundwork has raised $2 to $4 from its donors, the Clean Ohio Trail Fund, Interact for Health, Greater Cincinnati Foundation, and Duke Energy Foundation. So far, about five miles of trail have been constructed. When complete, the Mill Creek Trail will extend fifteen miles through the heart of the City to the Ohio River, where it will connect to the Ohio Riverfront Trail, a planned park, and downtown Cincinnati. Groundwork Cincinnati Green Team tests water samples. Today, life has returned to the Mill Creek. Great blue heron and black-crowned night heron fish in the creek and many other wildlife species are back. The water quality is gradually improving. Mill Creek is becoming a major community asset and a place where people want to visit. Clearly, much more work is needed to restore full health to Mill Creek and wildlife habitat in the river corridor, but the progress to date is inspiring and provides a firm foundation for future improvements. Groundwork Cincinnati and its students, volunteers, diverse public/private partners, and Mill Creek Neighborhood Councils are creating a new legacy for Mill Creek, for people, and for wildlife. community capacity through education and training. Simply put, Groundwork Cincinnati’s work centers around youth, environmental education, clean water, planting trees, building trails, revitalizing neighborhoods, and engaging the public in river improvements.